When I originally signed up for the Bridge Run I set the goal of completing it in the 48 minute bracket in order to achieve an 8-minute pace. However, due to the triathlon training I’ve been doing, I’m only getting in three runs a week and have not dedicated as much time to speedwork as I had been planning. All of my runs have been averaging anywhere from an 8:40-9-minute pace so I was curious to see what I might be able to achieve at the 5K. 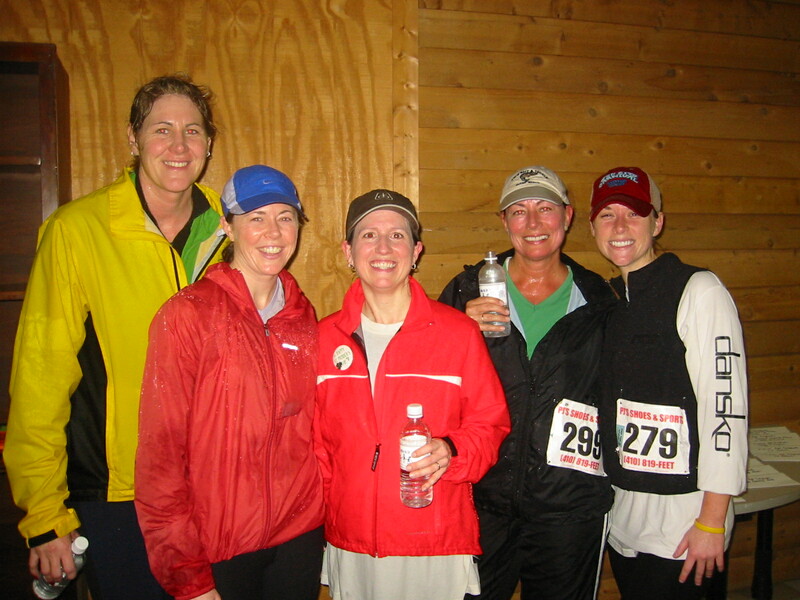 The forecast was gloomy at best for race day–53 degrees, 100% chance of rain, and predicted 40mph winds. Super. On the morning of the race, however, it wasn’t the heavy pour I was expecting and the winds weren’t that bad, but it was no day at the beach either. I pulled together all my gear including a towel, change of clothes, and extra shoes and socks for post-race. By the time I finished the hour drive to Denton there was a steady rain and heavy winds yet I still had the familiar excitement I always do on race day. Pulling into the parking lot and seeing other runners stretching, doing laps, and buzzing around in the rain was awesome and reminded me that runners are a wonderful kind of crazy. I did a short lap around the start area and realized we’d be finishing into a strong headwind. By the time we lined up at the start however, the rain had died down to a drizzle and we were all hopeful it might let up for the entire race. The first mile was extremely pleasant and I almost second guessed my attire–I wore my compression tights (because they dry pretty quickly), a wicking tee under a long-sleeve wicking shirt, and a super lightweight rain jacket plus a running hat. I hit the first mile at 7:30 which was also at a clearing in the route which allowed a crosswind to drive pelting rain directly into our faces. It had started to pour. After a quarter mile we were on a tree-lined street again and relatively protected from the heavy rain. It was 15:12 when I got back to mile two and I was pleasantly surprised with my pace but I could also feel that I was pushing it pretty hard. Passing back through the clearing was a challenge and I was looking forward to rounding the corner and having the wind at my back; the wind was so strong I literally felt like it was pushing me faster than I go could go. I passed a female runner that had been just in front of me most of the way and tried to stay comfortable at my faster than normal clip. The streets had filled with puddles and the last a half mile and turn to the finish was in driving rain with heavy wind. Race organizers were directing people to pass through the finish at a set of cones and collected the tear-off part of our bibs to determine the finish order. I almost passed a guy in front of me but I think when he saw a girl was on his heels he found his extra gear and sprinted across the line. I followed with a smile on my face and a 23:49 on my watch. I grabbed my camera and huddled under a pop-up tent at the finish line to watch my friends come in. They all finished strong and it was cool to see everyone cross the line in a torrential downpour with the gratifying sense of accomplishment that goes along with finishing any race. Runners gathered inside the Human Services building and waited for the awards. There were 140 runners in total that showed up which I thought was impressive given the weather. 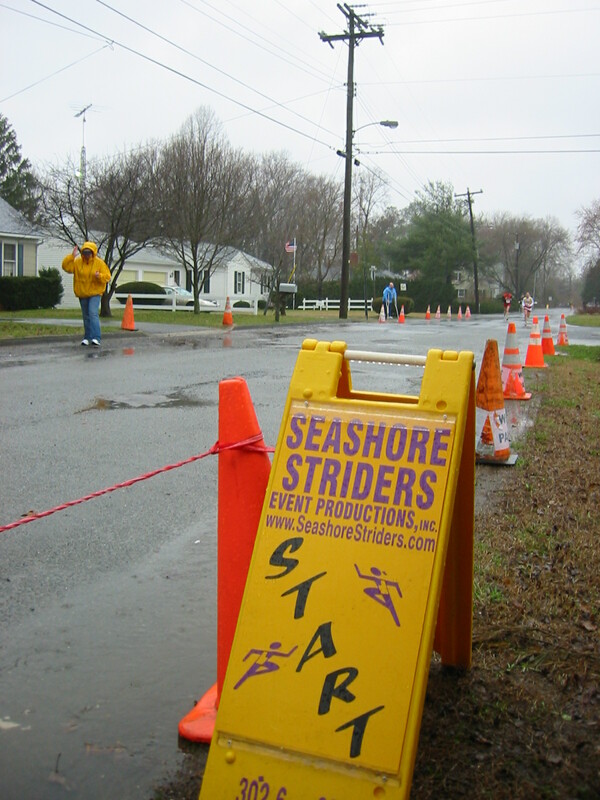 The group included a lot of Seashore Striders and it was neat to see that it truly was a community event and I was reminded of how much I enjoy small races. The crowd is manageable, everyone supports each other, and the atmosphere is relaxed and friendly. Plus, because it was a St. Patrick’s themed run there were runners dressed for the occasion and it is always entertaining to see the spirit and costumes that runners put together. 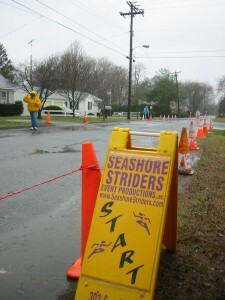 I think the Seashore Striders did a great job with the event, particularly given the weather. My finish was an unexpected PR. The final time of 23:49 put me first in my age group (now 30-39), I was 15th overall, and had a 7:41 average pace. While it’s encouraging to see that I was able to achieve race pace I am not going to assume I can keep that pace for double the distance in two weeks. You can trust that I will report back! Natalie – Great blog. It pretty much perfectly describes the day. I was about a minute behind you but it shattered my PR by three and half minutes and I won my age group (40-49 males). I’m convinced that I’m not actually that fast, I just wanted to get in out of the rain! I’m also looking to move up to a 10K later this year, I just haven’t decided which one yet. I’ll be curious to follow your progress. Good luck!! Lynn, thanks for checking out the blog. Congrats on your PR and age group win! I tend to agree that the weather may have prompted additional speed. 🙂 The Annapolis Striders put on a number of good races on this side of the bridge but no 10Ks that I am aware of. The Baltimore Falls Running Group also puts on a ton of races and I bet their schedule may include a 10K. Either way, good luck with the next distance! Thanks Trevor! Congrats on your first 5K. Isn’t it nice to know that if you can do it in weather like we had on Saturday you can surely run in anything?! I also think it’s cool that you and Lynn got to see each other in a whole new element; yet another reason I love running. I presume evonreye needing to hop on a bus to the start will be wanting to park on the open patch of grass at the bottom of Beach Road. I’m going to be sure to be there early to catch one of those first three busses, as I presume anyone that misses those first three busses will have to either walk or get a lift with someone to Oxford Striders to catch one of the remaining 9 busses? I’m not sure parking is going to be allowed at Striders (on the field)? I’m hoping to park as close to the finish at Nahoon as possible so I don’t have to walk far to my car after the race. A nice warm up walk up Beach road to Striders before the race might be handy, but not for tired old legs after the race.I’m not sure yet that I’ll be running on the day (it will be my 14th if I do), but to evonreye taking part for the first time, this is a fantastic challenge, and good luck to all!